Sure, Justin Bieber has his crib nearby and Britney Spears calls Lake Sherwood home sweet home but the new neighbor that’s got me as giddy as a heartstruck teenager is Village Fish Market in Calabasas. 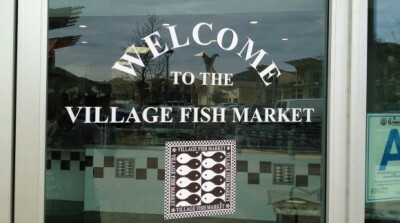 You see, Village Fish Market is part-owned by Gerald Cigliano one of the former owners of Santa Monica Seafood, a veritable Southern California institution that’s been selling the highest quality seafood both to the public and to the top restaurants in the region since 1939. Gerald Cigliano and business partner Barry Cohen, a 47 year veteran of the seafood industry initially had plans for the space formerly occupied by Bauducco’s in Westlake Village but instead they have found a home ten minutes away at The Summit in Calabasas, off the Lost Hills exit. 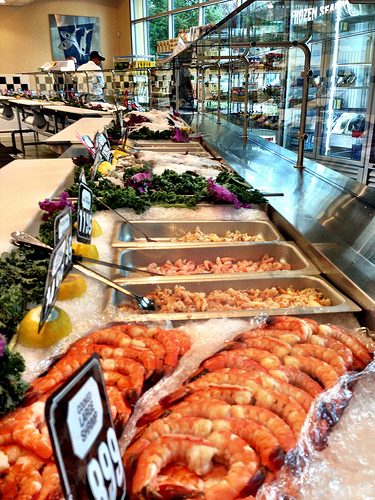 Echoing Santa Monica Seafood’s modern, spacious design, they have built a 5,500 square foot market and restaurant where seafood is definitely the star. On the market side, take in the beautiful selection of freshest crab, Kumamoto and Fanny Bay oysters, Prince Edward Island mussels, scallops and different varieties of shrimp on display in the 40 foot long glass case facing the entrance. Hand pick a whole sea bass, snapper, arctic char or rainbow trout to take home for dinner or purchase by the pound. Pick up some live lobster, smoked mussels, sushi grade tuna or smoked salmon made in-house in their sub-zero sized smoker. On the restaurant side, chef Jason Segal has created an extensive and ambitious menu to please everyone that includes traditional favorites like clam chowder and fish and chips, a Raw Bar and Sushi menu, plus some truly inventive dishes like those found in the Mezze or small plates menu: Lobster Risotto with Sweet Miso, Seared Scallops with Prosciutto and Yuzu Basil Oil and Blue Fin Tuna Carpaccio with Truffle Oil Dressing. Here’s how it goes: Customers stand in line at the register to place their orders, receive a pager and proceed to sit themselves – my least favorite part of the whole experience but thankfully once you have secured a table, servers will bring your food and are totally ready to procure anything else you might need during your meal. On a recent visit a couple of weekends ago, I tried the steamed mussels in garlic tomato broth and boy was I happy. The broth was slightly spicy and just thick enough to cling to the tender, perfectly cooked mussels. 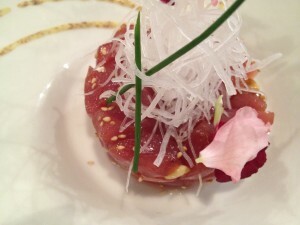 We also enjoyed the delicate Asian flavors of the Tuna Tartar with pine nuts and avocado. Judging by how busy it was on that evening, it’s clear that this area has been hungry for a place like Village Fish Market and that in no time, it will bask in the same fan following that its Santa Monica cousin has enjoyed for years. Debbie Pappalau is the Editor of My Daily Find Conejo Valley. This article was first published on February 21, 2013.